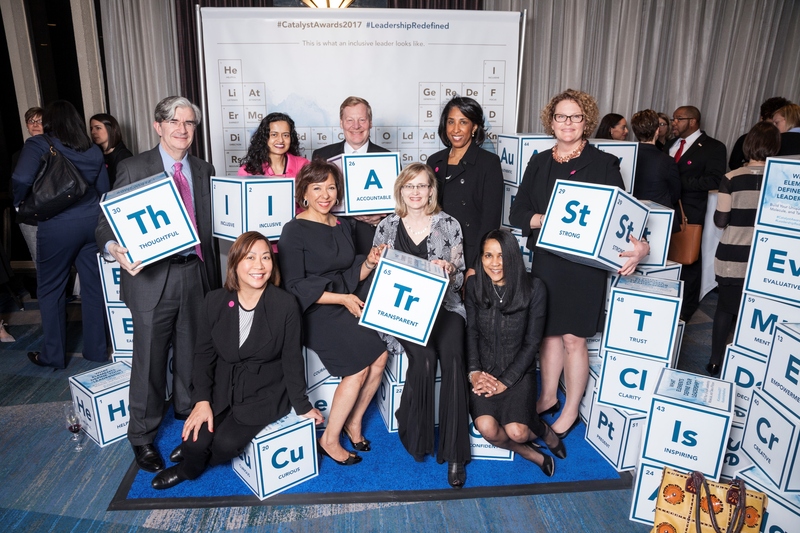 DuPont's Ed Breen (center, shown here with DuPont colleagues) recently joined with more than 40 other business leaders as a Catalyst CEO Champion For Change, pledging to continue driving and reporting measurable results in the advancement of gender equality. Building on a long legacy of promoting diversity and inclusion not only within our employee ranks but also in our communities, DuPont recently received recognition for its efforts and – led by DuPont Chair & CEO Ed Breen – committed to further action. Catalyst CEO Champion for Change: DuPont CEO Ed Breen recently joined with more than 40 other global business leaders in pledging to continue driving and reporting measurable results in the advancement of gender equality. Catalyst – a global thought leader and partner in accelerating the progress of women at work for more than 50 years – developed the Champions of Change effort. "As leaders, we must hold ourselves and our teams accountable to make this change happen," Ed noted in signing the Catalyst pledge. "DuPont," he added, "can succeed by working together to build a more inclusive workplace culture, not only because it's the right thing to do, but it's also the smart thing to do." Identifying and working to reduce any structural barriers or unconscious bias that may exist in our businesses and functions and doing more to continue to build an inclusive workplace culture at DuPont locations across the globe. With founding member companies involved in the Catalyst CEO Champions for Change initiative representing more than 8.7 million employees, the positive ripple effect from this commitment by Ed and the other business leaders is expected to help to go a long way in building work environments where everyone has a fair chance to succeed. Executive Leadership Council Fortune 500 CEO Action for Diversity and Inclusion™: ​On June 12, 2017, The Executive Leadership Council launched the F500 (Fortune 500) CEO Action for Diversity and Inclusion™ pledge signed by more than 100 CEOs, including DuPont CEO Ed Breen. The pledge is largest CEO-driven business commitment to date in advancing diversity and inclusion in the workplace. ​​Continuing to make the workplace a trusting and safe place to have complex and sometimes difficult conversations about diversity and inclusion. Openly sharing best practices and learnings among companies on what is and is not working to improve diversity and inclusion. By implementing these three actions, CEOs, in partnership with The Executive Leadership Council (ELC), will build a more diverse and inclusive workplace. This commitment is driven by a realization that addressing diversity and inclusion is not a competitive issue, but a societal issue that CEOs can play a critical role in addressing. The pledge is meant to be the first step in leveraging the collective power of the business community to advance such an important issue. US Business Leadership Network® Going for Gold Project: In 2017, DuPont signed on to be part of the USBLN Going for Gold Project. Joining this initiative will provide DuPont with access to subject matter experts and programs to strengthen our disability inclusion initiatives. The access to leading practices and tools will enable DuPont to enhance our existing programs in this important area. Top Score on Disability Equality Index: The Disability Equality Index (DEI) is a joint initiative of the American Association of People with Disabilities (AAPD) and the US Business Leadership Network (USBLN). It was developed by a diverse group of experts to assess companies on their disability inclusion policies and practices. Companies submit responses on several categories, including: Culture & Leadership, Enterprise–Wide Access, Employment Practices, and Community Engagement & Support Services. In 2016, DuPont received a ‘100’, the highest possible score companies can receive on the index. Read an example of how DuPont is supporting its employees with disabilities here. DuPont’s commitment to diversity and inclusion is both a Core Value and business strategy for our company. The value of a diverse and inclusive workplace can be seen in every aspect of our business, including talent development and recruitment, customer orientation, corporate strategy, and even our innovation processes. In addition to the new commitments described above, DuPont continues to be recognized as a leading company for its diversity and inclusion commitments. In 2017, DuPont was named to DiversityInc’s “Top Companies for Global Diversity”. We were also named to Working Mother’s 100 Best Companies for the 27th year; to the National Association of Female Executives “Top Companies for Executive Women” for the 9th consecutive year (and 13th in total), and; earned a 100% on the Human Rights Campaign’s Corporate Equality Index and earning placement on the Index for the 10th time.